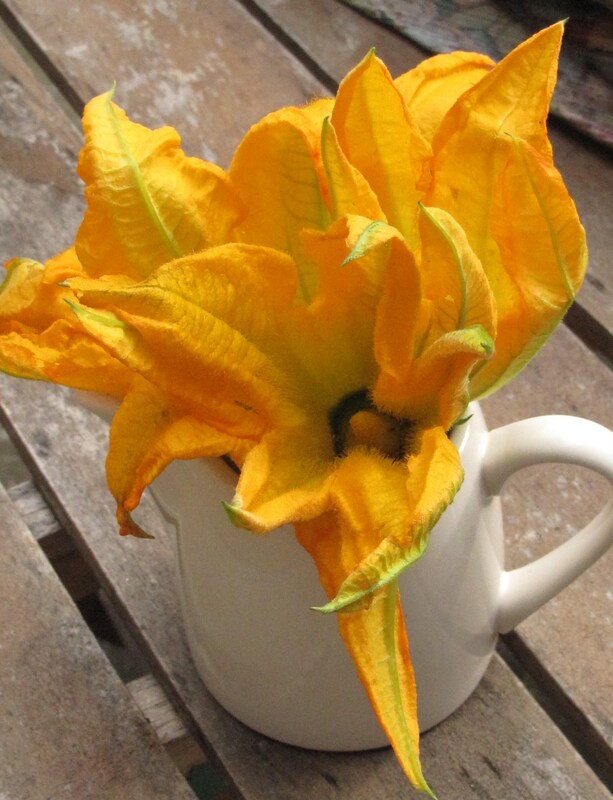 This week we have a special treat – courgette flowers. As you can imagine they’re big in Italy where they like them stuffed with Ricotta or Mozzarella then coated in a light tempura style batter and deep-fried til golden. In Mexico they use them to stuff quesadillas and to make soup. You have 2 in your bag this week so soup is going to be out of the question but not to worry, the classic Italian style (stuffed and deep fried) is hard to beat. This way they gently steam inside the batter and lose none of their delicate flavour. The batter you make to coat them should be as light as possible. I either use self-raising flower and sparkling water which introduces lots of air or a beer batter which works well too. 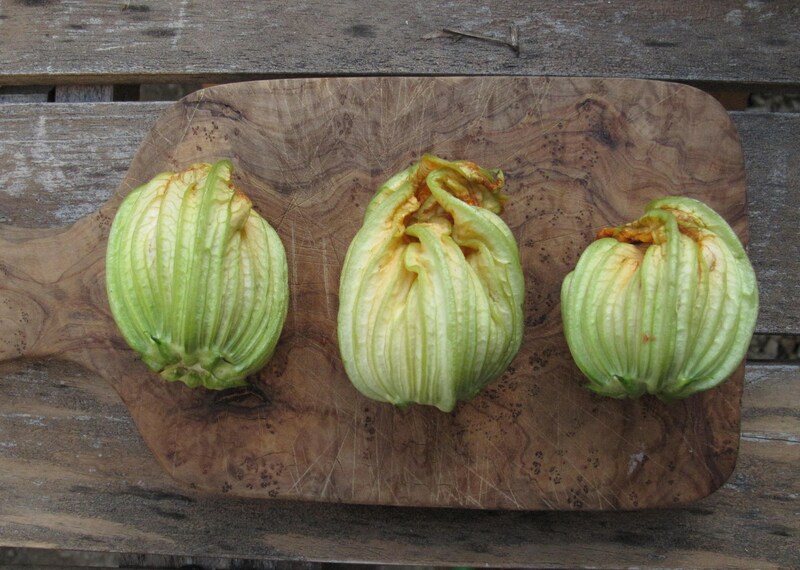 The flowers sometimes come attached to small super-tender courgettes and I generally leave these attached to the flower although you can detach them and cook them separately or add then chopped finely to the stuffing. This recipe will work with any summer squash flowers or also with pumpkin flowers. You can of course use other cheeses. Feta and goat’s cheese both work well but maybe not with the anchovies as they are quite salty and the saltiness of the fish is overkill. Another filling to try is soft goat’s cheese (about a teaspoon) and a drizzle of honey over the finished dish just before serving really makes it. Close up the petals to seal in the filling. Make the batter by mixing the flour with the sparkling water. Start by adding a cup then mix adding more water as necessary until you have a batter as thick as buttermilk. Heat the oil in a pan to about 160 degrees. Before you start frying drop a tiny bit of batter into the pan and if it turns golden brown in about a minute you’re ready to go. Any faster and you should turn down the heat a little or the flowers will burn on the outside before the courgette has cooked. 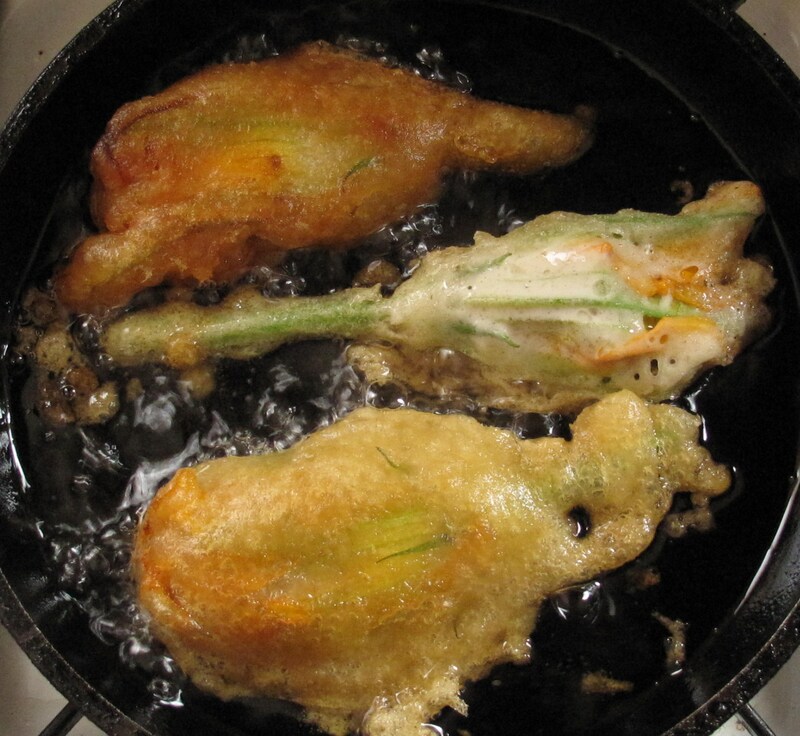 So, when the oil is ready coat each flower carefully and gently put them into the pan and fry until golden. This will take about 2-3 minutes on each side. Serve immediately with a squeeze of lemon and some salt and pepper. 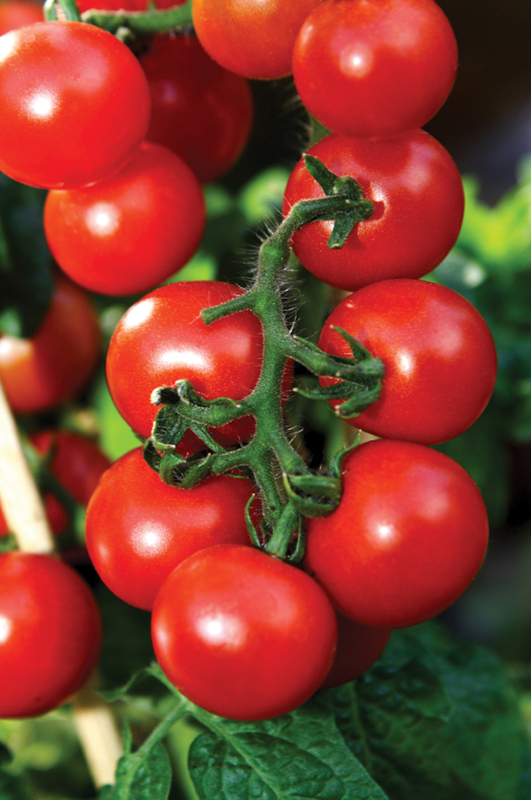 Make a rich gutsy tomato sauce to serve with the tempura flowers – Gently saute chopped onion (1 0r 2 should do it) in olive oil over a low heat until starting to change colour. Add 4 or 5 cloves garlic chopped and cook for a further 5 minutes until very soft. Add a tin of chopped tomatoes, a generous pinch of sugar and some salt and continue cooking for a further 30 minutes or so until it has reduced by half . Serve with the flowers and a green salad. These babies are really really fragile so whatever you decide to do, do it ASAP – this evening or for lunch tomorrow to get them at their best – You won’t regret it! You will of course have batter mix leftover and I’d suggest using it to make a tempura with other veg while you’re at it. Peppers, carrots, aubergine and scallions all work well. And for dessert? ……….. cherries of course!!! This week our bags have lovely Spinach which is a great fast food. After a thorough wash (it can be very gritty), you destem the leaves then pack them in a pot and steam them in the water left clinging to the leaves. Cooking will take about 2-3 minutes then you can serve it straight up with a knob of Butter or a drizzle of Olive Oil. For a really delicious sidedish sauté a few chopped cloves of Garlic in Butter then throw on the Spinach, mix everything together well and serve. For a maincourse add some cream and Parmesan and you’ve got a very quick pasta sauce. This week’s recipe is a pasta dish but without the cream as I’m sure that we’d all like to hit the beach at some stage this year…………..
First of all stick on the kettle for the pasta (this dish is fast) Wash and destem your spinach then roughly shred it. Stem the leaves as described above then wring out any water with your hands as soon as it cools down. While the Spinach is cooling stick on the pasta. Chop the Garlic then gently sauté it in a large knob of Butter and some Olive Oil. When the Garlic has softened (don’t let it change colour as it’ll start to burn very quickly after that) add the Spinach and toss well to make sure it all gets coated in Butter and Garlic. When the pasta is cooked drain it and mix into the pasta adding some more Butter and Olive Oil aswell as a couple of tablespoons of freshly grated Parmesan and the Olives. Spinach is, of course, fab in all kinds of salads and sambos.Try it with sundried Tomatoes, toasted Pinenuts and Goat’s Cheese or with Walnuts and Feta. Dress with Olive Oil and Balsamic Vinegar and serve with a simple Omelette or some fish.